The story, 'The fowler and the quails,' is a jataka story, part of the Pali canon. Once upon a time, the boddhisattva was born as a quail and lived in the forest as the head of thousands of quails. A fowler, who came to catch quails, used to imitate the note of a quail to attract the birds together. Then he flung his net over them to catch them all at once before going home to sell them for a living. Observing this, the boddhisattva said to the quails, "This fowler is wreaking havoc on our kinsfolk. I have a way to avoid capture, but you all have to work together to make it a success. In the future, whenever the fowler throws the net over you, bring your head out through the mesh and fly away together to a thorn bush, where we can all escape." "Very well, we will do accordingly," they all replied. Next day, when the net was cast over them, they did just as the boddhisattva had asked them to do. They lifted up the net and dropped it on a thorn bush, escaping themselves from underneath. The fowler had to return empty-handed after spending hours disentangling his net from the bush. Day-after-day the quails worked together to foul the fowler's plans and the fellow had nothing to show for his efforts upon returning home. His wife grew impatient and angry with this sudden incompetence. 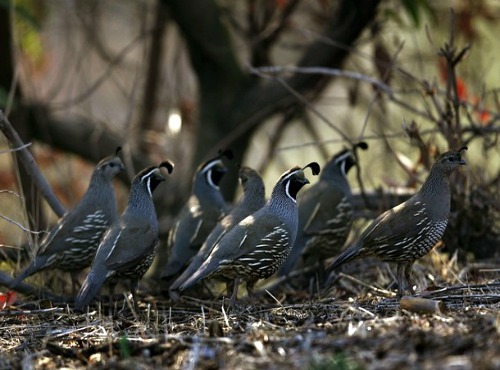 The fowler explained to his wife "The quails work together now - the moment I throw my net over them, they fly off with it and drop it on a thorn-bush to escape. But, they won't live in unity always. As soon as they start bickering amongst themselves, I will bag them again." He almost sang out loud, "While concord reigns, the birds bear off the nest; when quarrels arise, the birds fall a prey to me." Not long afterward, one of the quails accidentally landed on another's head and an argument ensued. They bandied insults and taunted each other endlessly. The boddhisattva, who was watching from a distance, thought to himself, "There is no safety with one who is quarrelsome. The time has come when they will no longer lift up the net and bring about their own destruction. I can not stay here any longer." And with his following, he went elsewhere. Soon afterward, the fowler came back and attracted them by imitating the note of a quail, and when they had gathered together, flung his net over them. Rather than flying, one quail said to the other, "They say, when you were at work lifting the net, the hair from your head fell off; now's your time, lift away." The other replied, "They say, when you were lifting the net, both your wings molted; now's your time, lift away." But, while they were each exhorting the other to lift the net, the fowler lifted the net for them, crammed them into a basket and took them home to his eager wife, who was happy beyond measure to see them. The message of unity and concord in this jataka tale rings true. How many times have we quarreled and failed to overcome our petty differences only to fall prey later to manipulation and abuse by a third party, who takes advantage of our disunity? If you liked the Fowler and the Quails meditation story above, you will also like reading the Feast for the Dead and The Discontented Ox.